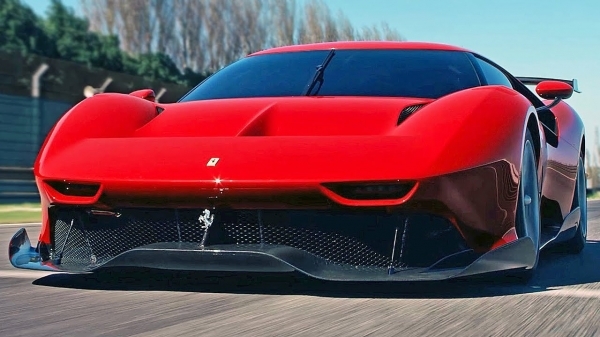 The Ferrari P80/C thus set the Ferrari Styling Centre an ambitious target: to develop a new kind of product that simply did not exist in the current Ferrari range: a sports prototype inspired by the cars that essentially wrote their own styling rules becoming, in the process, famous icons that, although conceived as track cars, also went on to influence a whole series of elegant road cars. It is a track car, which means that performance is a major factor so this not only pointed the design team in the direction of a design that was absolutely unique, but also forced them to make radical changes to the running gear of the donor car. This involved introducing specific features required to guarantee a captivating marriage of style, technical prowess and aerodynamics. The decision was made to use the 488 GT3 chassis as a basis, not only for its performance, but also for its longer wheelbase (+ 50 mm compared to the 488 GTB) which allowed more creative freedom. With respect to the Ferrari 488’s classic layout in which the cockpit tends to be placed centrally, the GT chassis allowed the designers to emphasis a cab forward-effect in which the rear is elongated, lending the car a more aggressive, compact character. This was one of the cornerstones of the P80/C’s styling from the early stages of the design process.